une autre mère: why the french title? 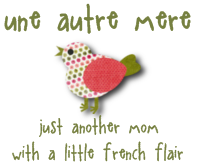 Since I started this blog, the big question has been, "What does une autre mere mean anyways?" And the answer isn't all that exciting. I tried hard to think of a name that would reveal something about my "mommy-hood." I have friends who are "sneaky" and "natural" and "baby factories." And it seemed I had nothing unique to offer except that I'm "just another mom." But that seemed a little too boring, so I incorporated my love for the French language (which I used to teach) hoping to make it a little more interesting. So, if you came to this blog hoping to find a vault of quirky, insightful "frenchy-ness," I guess I've disappointed you. Although I am considering trying to add some more french in here and there. I'll try and work a little harder on that. Oh, and FYI - it's pronounced, "oon ohtra mare"